I hope you are all having a great weekend. I have just came home from our favorite restaurant, which has Japanese and our favorite dish is Ebu-Tempura-Maki. I hope I write it correct, it is an inside-out roll with warm prawns and a delicious sauce. I just can't get enough of it! Each year around lunar new year, companies like Dior, Guerlain and Chanel release Asia Exclusive collections. These collections then make it partly to the States. What is left for rest of the world is to read blogs and get angry. I am hear to tell you, this year there is not too much to get upset about *wink*. Here are my thoughts about the eye department of the collection. I have also two of the cheek products which I will try to cover in a separate post. The center piece of the collection is a new and limited eye shadow palette, Chanel Les 4 Ombres #248 Tissé Rhapsodie. It has an interesting combination of pink and violet with a deep bronze khaki if there is a color like that. The deepest shade is really very complex and beautiful. In the pan they all look very pretty. Purple looks like duo chrome. 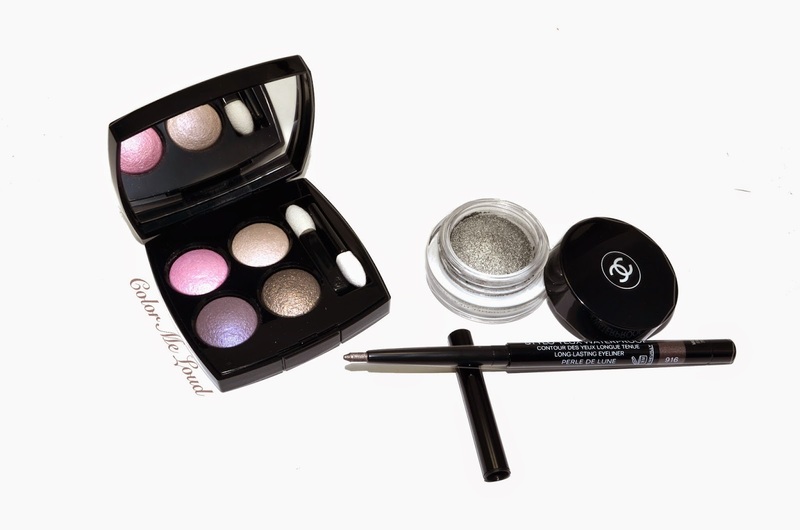 Chanel's new eye shadow formula is one of my favorites and as this quad is "purple", I had to have it. When I swatched the shades I was very impressed. They all have good color pay-off and buttery texture. Top left: a light to medium neutral pink with satin to shimmery finish. Top right: a very light neutral white with shimmery finish. This shade is great for highlight such as on inner corner or lightly dusted under the brow. Bottom right: a deep golden bronze with khaki undertones and satin to shimmery finish. 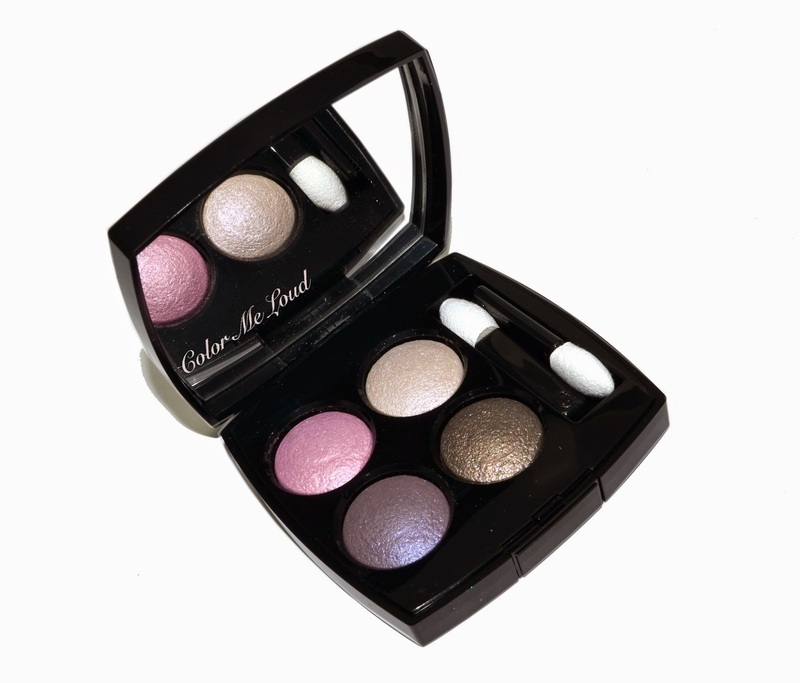 It is a lovely complex shade with multi-colored shimmer. Bottom left: a deep cool violet with satin finish. After the swatching phase, my honeymoon with #248 Tissé Rhapsodie was over. I have tried it on the eyes and I tried it many times, thinking I didn't use it to its potential. Each time though, the whole look turned much pastel than I would like it to be. The complexity of the shades on the swatch was also never showing itself truly on the eyes. Not that there is anything with a spring quad being pastel but after swatching I didn't think it would turn out like this. For the look below I applied the violet to the inner and outer lid, pink on the mid-lid and the deepest bronzy shade on the crease. As you see there is nothing all that special on the eyes. The gorgeous multi dimensional shimmer is rather gone. Tissé quads, as far as I know, are not made to be used wet either. There is also a silver Illusion d'Ombre in the collection. These can be used alone, under the eye shadow or over it. I tried Illusion d'Ombre #102 Mysterio in all ways. Alone it is a gorgeous natural silver. Since it is not too cool, I can wear it all by itself. I then tried to apply it under the quad. I know that some Chanel collections have a matching Illusion d'Ombre to the Quad of the collection. This one though made it all look muddy, thus I had to remove the eye make-up and start again, so not recommended. My favorite way to use Illusion d'Ombre #102 Mysterio though is to tap just a tiny amount over the look with the eye shadow quad. It brings a taupe touch to it as well as some complex shimmer, it is beautiful. Although I didn't like the eye shadow quad once worn on its own, with Mysterio, I liked wearing it. 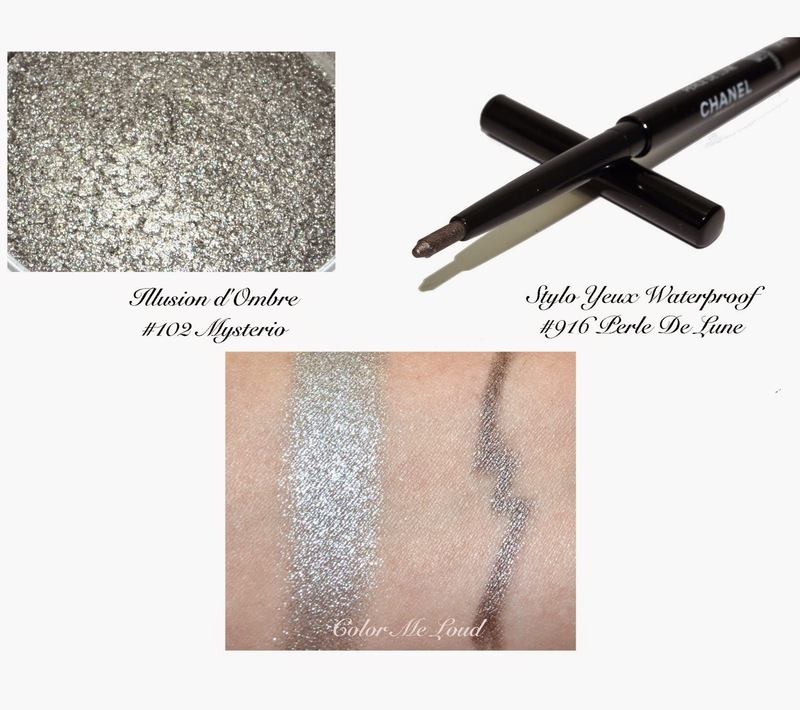 My favorite piece from the collection must be the Stylo Jeux Waterproof Eyeliner in #916 Perle de Luna. I like Stylo Jeux especially on the water line or along the lower lash line. This one is a gorgeous shimmery taupe which leans slightly lavender. It brightens up the lash line very nicely. The consistency of #916 Perle de Luna is soft and it is very easy to apply. Oh and I love love love its name! For the look below I have applied #248 Tissé Rhapsodie in a classical sense. 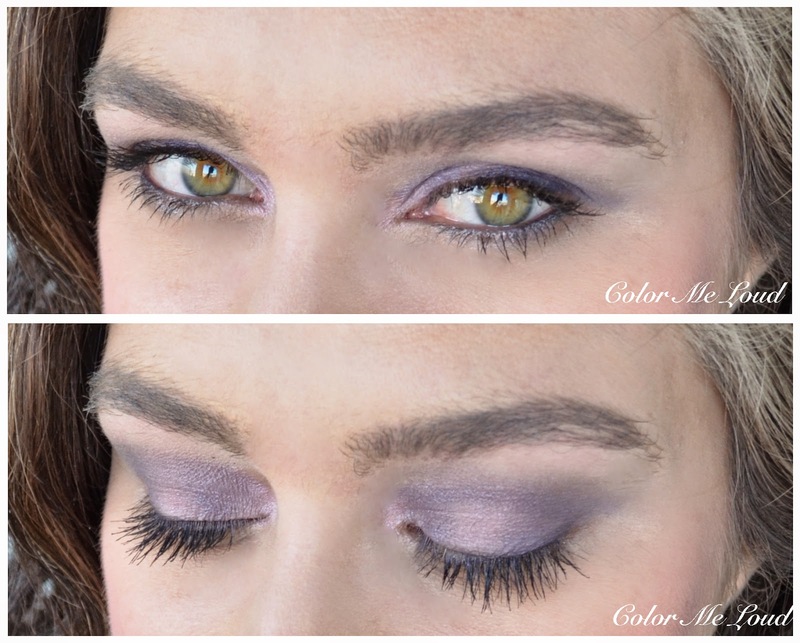 Pink on inner half, violet on outer half and bronze on the crease. I have then applied #102 Mysterio on the inner half over the pink and blended it on to the violet. 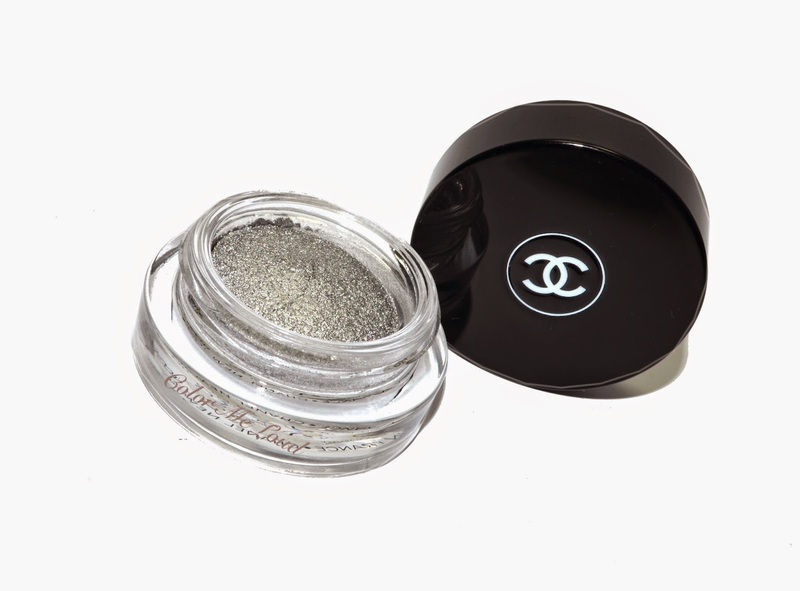 I also applied #916 Perle de Luna along the lower lash line and waterline. I like this resulting look more than the pinky violet one just because it looks less pastel and more taupe/silver. Final thoughts: Although I like the shades once swatched, #248 Tissé Rhapsodie on the eyes is a little too flat and pastel for my taste. I like it though when I apply #102 Mysterio on it. My favorite piece from the collection is Stylo Yeux #916 Perle de Luna. It brings the light to the lower lash line in a beautiful way. Availability: Now available in Asia and at chanel.com in the States. Please let us know in the comment section below if you know where else to get it. 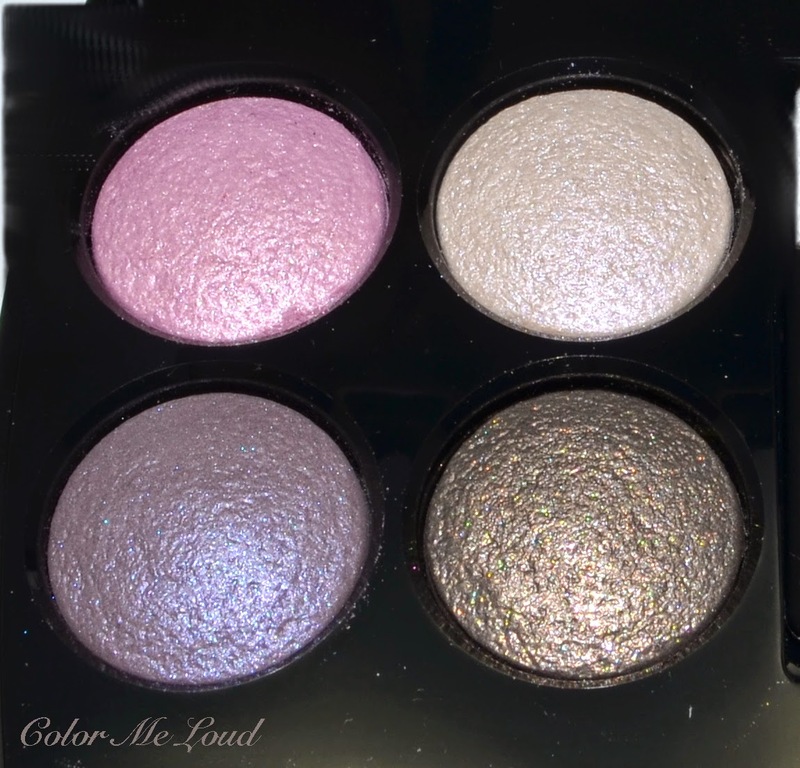 Do you use your metallic cream eye shadows frequently over your eye looks? Dislaimer: The products in this post are purchased by me. Hey Sara, I actually really like how the quad looks on its own, but I can see that it might not be what you were expecting! Sometimes when the eyeshadows I use turn out to look a little dull and flat, I also pat something shimmery on top. It doesn't happen so often tho! I really like the quad both on its own and with the #102 . It's a pity it's not available in Europe, I'd get it if it were. I got the eyeliner. The color is just beautiful. I was tempted by the Illusion d'ombre but didn't buy it in the end. I'm really glad that Chanel reformulated (or should I say re-reformulated their quads). Couple of years ago after they changed the formulation they were so dry and difficult to use. Now let's wait for the summer collection. I took one look and knew that the Quad wouldn't work for me.My favorite item from the collection is also the Yeux Stylo. I got a backup. I think you will get a lot of use out of the Ombre-- like that it's a neutral metallic. thanks so much for your lovely words. I believe these are a hybrid formula between baed and powder. When I asked at the counter, they told they are not supposed to be applied wet. I tried though (at my own risk) and liked the more intense effect. This particular quad doesn't need that though, it is nicely pigmented. I love the Ombre, as you said it is natural enough to be worn alone and doesn't clash with my undertones. Love love Yeux Stylo! The darker shade is my favorite as well!! I am glad you liked it because I didn't lol. Yes I was expecting something more... neutral and this one was too pastel for my taste. I like purple but please no pastels lol. Hi Sara, yay i loved Perle de Lune too, and i'm so glad you decided to get it in the end! 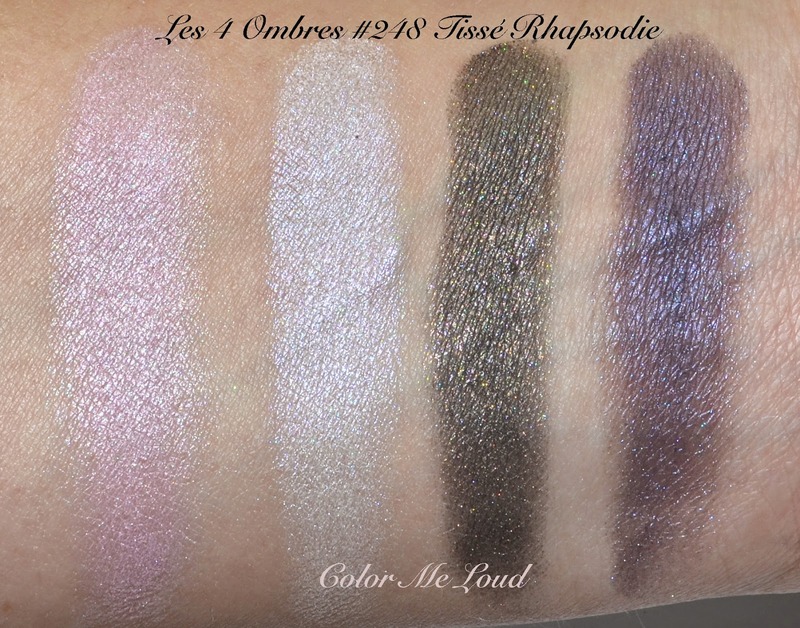 Tisse Rhapsodie actually looked stunning on your eyes, but I understand the disappointment when all that gorgeous complexity and shimmer just doesn't translate on the lids. :\ The only thing that i didn't get was Mysterio as I'm just not sure how it'll look on my eyes. Let's see how those cheeks perform on you! That swatch of the bronze shade is to die for, but so disappointed it didn't translate on the lids :( Such a shame, because the colors in the palette look so pretty for spring. I like the last eye look you did!